Army National Guard Specialist Jacob Roach hugs his siblings on Monday after surprising them at school. Specialist Jacob Roach (fourth from left) is pictured with siblings Nicholas Little, Elizabeth Spires, and Simon Spires, and their mom Donna Spires. 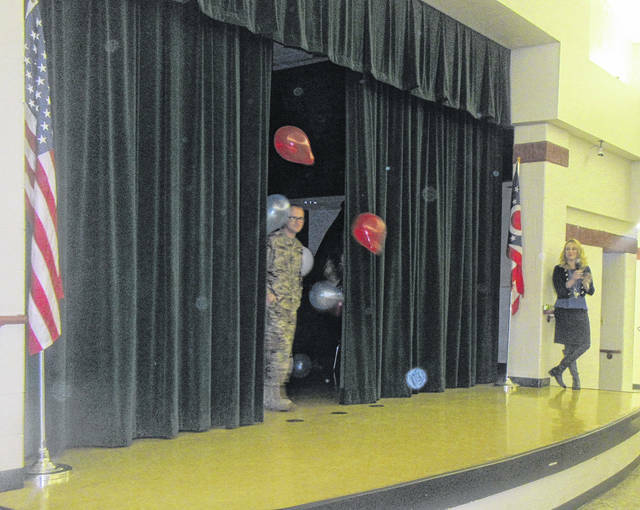 Specialist Jacob Roach appears from behind the curtain at Eastern Elementary Monday morning. Eastern band members Teddi Casto, Heather Ridenour and Tressa Bartimus play for students prior to the surprise homecoming. Simon Spires hugs his older brother Specialist Jacob Roach at a homecoming event on Monday at Eastern Elementary. 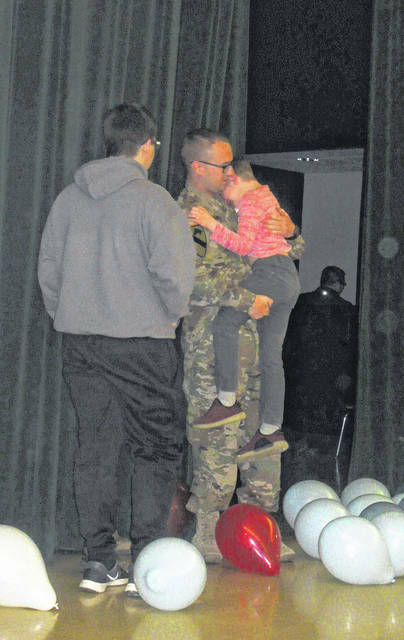 REEDSVILLE — After a year away serving with the Army National Guard, Specialist Jacob Roach returned home over the holiday weekend, surprising his siblings at Eastern Elementary School on Monday morning. Roach, a native of the Meigs and Athens County areas, was deployed to Afghanistan with the 2-174 Air Defense Artillery out of McConnelsville. Roach is the son of Darin Roach and Donna Spire. 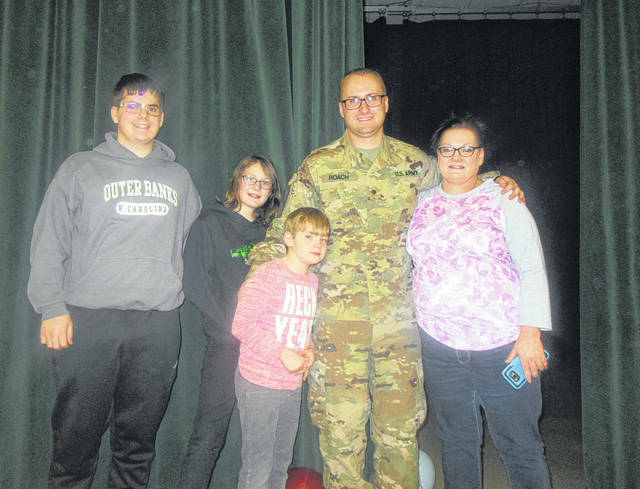 Returning to McConnelsville on Saturday evening, Roach spent that evening and Sunday seeing family members on his dad’s side, with the surprise set for Monday morning for his siblings, who did not know he was back from deployment. As middle school students ate lunch in the cafeteria Monday morning, the third grade students also arrived in the cafeteria for what they thought was to be a performance by a few high school band members. 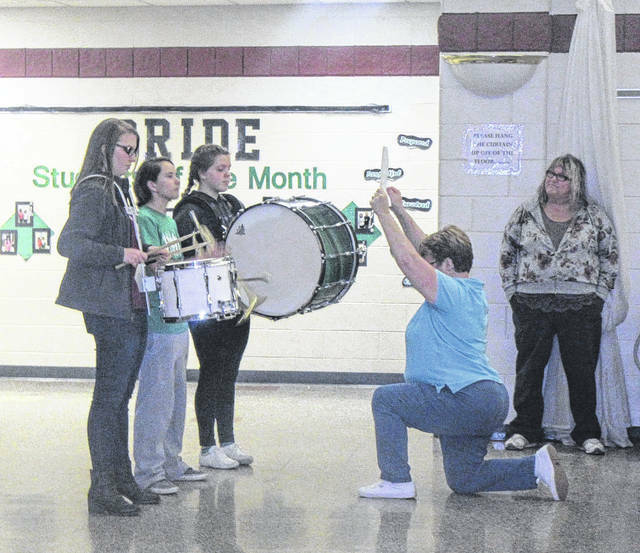 Band members Heather Ridenour, Teddi Casto and Tressa Bartimus did play a song for the students before Principal Robin Burrow took to the microphone. Burrow told the students to give a warm welcome to Specialist Jacob Roach who was returning from deployment. When the curtains of the stage opened balloons were thrown into the air and Roach walked onto the stage. Roach’s brother Simon Spires, a third grader at the school, looked at the stage as the curtains opened saying “That’s my brother” before running into his arms. Likewise, sister Elizabeth Spires came running from the back to hug her brother, with brother Nicholas Little, a sophomore, also joining the group on stage. Roach enlisted in the Army National Guard a little more than eight years ago, with this being his first deployment. Roach is employed at Lakin Correctional Institution, where he is currently on leave. Roach and his fellow National Guard members left on April 1, 2017, for training before being “boots on the ground” on July 1, 2017. The unit was in Afghanistan until March 11.
https://www.mydailytribune.com/wp-content/uploads/sites/42/2018/04/web1_4.3-Roach-1201842123710368-1.jpgArmy National Guard Specialist Jacob Roach hugs his siblings on Monday after surprising them at school. https://www.mydailytribune.com/wp-content/uploads/sites/42/2018/04/web1_4.3-Roach-2201842123712702-1.jpgSpecialist Jacob Roach (fourth from left) is pictured with siblings Nicholas Little, Elizabeth Spires, and Simon Spires, and their mom Donna Spires. https://www.mydailytribune.com/wp-content/uploads/sites/42/2018/04/web1_4.3-Roach-3201842123717450-1.jpgSpecialist Jacob Roach appears from behind the curtain at Eastern Elementary Monday morning. https://www.mydailytribune.com/wp-content/uploads/sites/42/2018/04/web1_4.3-Roach-4201842123720170-1.jpgEastern band members Teddi Casto, Heather Ridenour and Tressa Bartimus play for students prior to the surprise homecoming. https://www.mydailytribune.com/wp-content/uploads/sites/42/2018/04/web1_4.3-Roach-5201842123722168-1.jpgSimon Spires hugs his older brother Specialist Jacob Roach at a homecoming event on Monday at Eastern Elementary. 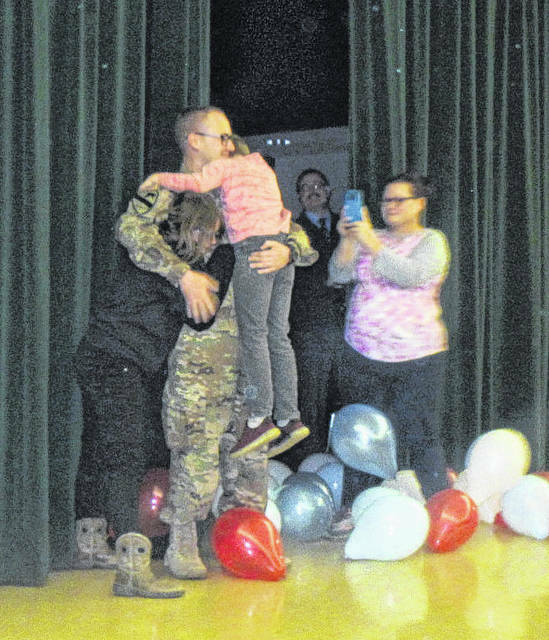 Video Caption: Army National Guard Specialist Jacob Roach surprises his siblings at Eastern Elementary on Monday following a one year deployment.